If You're An Artist, You Probably Need CrackZapIt! Jackson here. By the way, you don't have to be an artist to enjoy this Little Gallery. Thanks for looking. 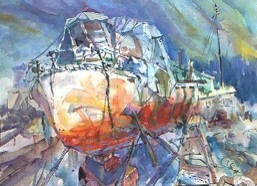 And here is another: To my favorite water colorist and North West Boat Painter (I like everything he does, but his BOATS float mine, that's for sure.) Eric Wiegardt. He also gives awesome classes (one of which I got to take) on location in the U.S. and elsewhere on the Planet. He's won a ton of awards and has written books on technique, and produced demonstration videos I happily bought myself. OK…boats out of the water, usually seen in repair yards, like this one at Ilwaco, WA, fascinate me. First, I can see the whole beautiful, functional sculpture of the hull, usually hidden when boats are in use. Second, I see myself and many others when our spirits or personalities, thoughts, ideas, are undergoing repair and revision. Especially when those articles have ceased to properly function. Rather than seeing a ‘busted boat’, I see the 'owner' is working on the boat and has a vision for its impending repair and re-commissioning. That gives me hope. I like the ‘big orange’ and the marks representing lines and tackle. Also the big blue jacks holding everything up. Christo is a guy who goes around covering and wrapping up stuff and has gotten other folks to agree with him it’s somehow aesthetically important (Art?).. and they pay him for it. Great work if you can get it. But I liked the pun, or double meaning based on a famous old boat brand, Chris Craft. Along with that is the pun of ‘christ’, small ‘c’ intended. Christ means anointed, which means specially chosen and equipped. (It’s fun to read the dictionary in your spare time). 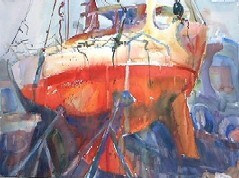 .. which will encourage rot in the older, traditional wooden boat. (BTW, saltwater doesn’t breed rot, it preserves the wood. Another scriptural reference to ferret out). I like the blue and orange together and all the stuff and tools and scaffolding and jacks really interest me. I guess I like the ‘exploding’ sky, too. This is from an on site drawing on Long Beach Peninsula, WA, like the 2 boat pics. Then I worked that up into a large, very spare drawing in prep for watercolor. Kind of inspired by various modern painters and artists of the first half of the 20th C who used the geometry of industrial scenery as their motif. I was in O-ville, I'd been taking a class from Eric Wiegardt.. He later told me that's where he grew up. In fact, this scene is at the Wiegardt Oyster processing complex where some of his pioneering family still work. It takes some time to ferret through all the 'stuff', (that I find fascinating), in the compacted composition. 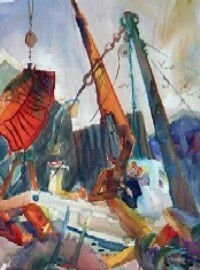 The somewhat crushed oyster basket in red-orange being pulled up or lowered by the crane is the hanging center of interest. And is very unusually placed near the edge of the picture plane. 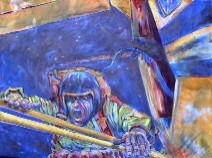 It was a little like painting a scene from 'Star Gate' to me - 'back in time'..
Self portrait, in oil pastel, about 22"x30". Around the turn of the 20th Century, a group called the Fauves (wild beasts), a name given by an Art critic of course, were new on the scene. They chose to use unusual colors to express intensity of emotion, a kind of ‘x-ray’ of a subject’s inner qualities... or their own emotional response to a subject. Vincent Van Gogh had exploded on to the Painting stage just prior to these folks. He was a powerful influence on them. Possibly a manic depressive, he did his best to closely express his deep and sometimes disturbed feelings about his subjects. His was a move away from the earlier Impressionism, which attempted to express the visual, abstract impression- sensual impression - of light reflected on to, and off of, objects. 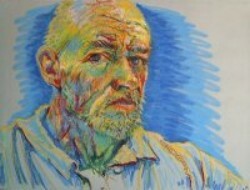 Here I am in a ‘Van Gogh’ kind of mood. I like the nose best. Inspired by a biographical photo from a camera that was mounted to the fuselage side of an old Howard, radial engined plane from the 40's: My third and last jump. I'm not into astrology, but the constellation in the background is Capricorn and I was born in early January. a 3'x4' oil painting, this is more closely related to Impressionism. It appears 'real', but has a distorted perspective that 'flattens' the picture plane. 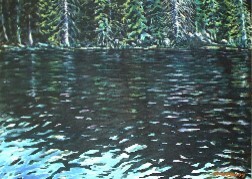 Mostly it is playing with the illusion of reflective water ripples, and attempting to express tranquility. This window is about 1'x 3', surrounded with a redwood frame. 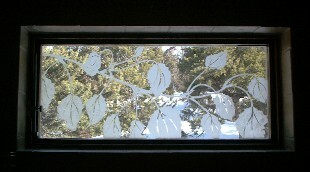 I took an Aspen branch, drew it freehand (while 'blowing it up' about triple) on contact paper applied to the glass. I then cut out what became the etched parts, painted acid gel on the exposed glass, let it sit, then peeled off the contact paper. It really gives a feeling of ambiance while standing in the tile tub surround I made. That'll wrap up the 'gallery' for now. If you want, send me pics of your Art you really like... tell me about 'em. Give me permission to use 'em (with attribution to you), and you might see your Artwork on another website I'm think about for teaching/coaching. Return from artist to Who-Needs-Crackzapit?